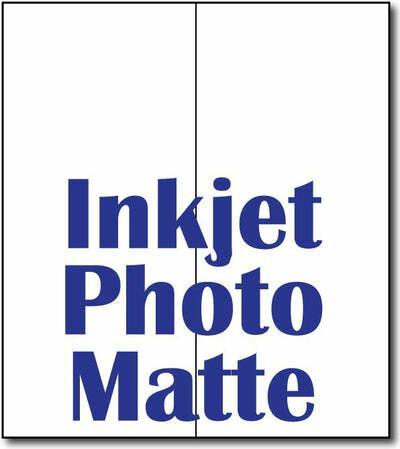 Folds to - 4" x 9"
Sheet Measures - 8" x 9"
Our Inkjet Photomatt slimline foldover cards are a fun and unique way to send your personalized greetings. They can be used for a variety of things, such as wedding invitations, birthday cards, or even holiday cards! When folded, these cards measure 4" x 9" and fit perfectly into our #10 envelopes! Made from a 85lb (230 gsm) inkjet photomatt cardstock measuring 8" x 9" before folding. There is a score down the middle of the invitation that allows for straight, easy folding. For use on Inkjet Printers only! Specifications: Each card comes flat measuring 8" x 9" before folding Each sheet is scored to fold easily Each card measures 4" x 9" when folded Fits perfect into #10 envelopes For Inkjet Printers only! Available in 100, or 250 sheet packs.